Hello my friends, hope you are enjoying the holiday season with family and friends. I am still trying to recover from Christmas, it came and went. Wow, where has this year gone? We are a couple of days away from 2017, crazy how time is flying by. Today I want to share a desk calendar using Happy 2017 Tilda. She was released a month or so ago and I love her. She is ready to celebrate 2017 for sure. I used my copic markers to color this cutie up. 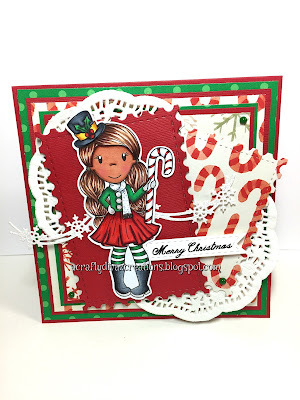 I masked her off to add the fireworks background stamp from My Creative Time. 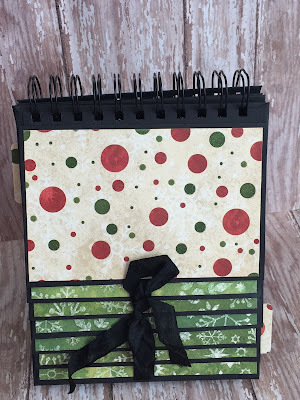 I added designer papers from Carta Bella Amour collection which is one of my favorite collections. She is holding a glass of champagne or sparking cider, so I added the glass from magnolia's advent calendar. 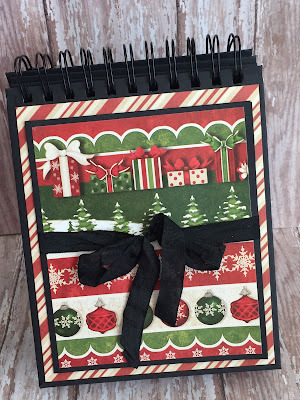 The heart border and Fabulous die are from La La Land Crafts which I thought would be perfect for this desk calendar. Hope this project brings some inspiration for you to get crafty. Thanks for stopping by. Happy Hump day friends, thanks for stopping by. 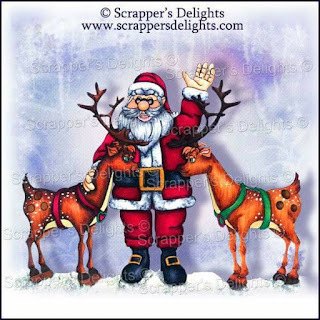 Scrapper's Delights is sponsoring the Kit and Clowder Facebook group advent calendar for the day. Today's image is all about Santa and the reindeers. You can pick up this image for free if you head over to the Kit and Clowder Facebook group. Now on to my project, I decided to create a Easel Desk mini album using the freebie image to hold my Christmas pictures. 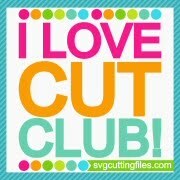 I used a you tube tutorial which you can find here. I colored the image using my copics and added it to the album. I love the way this turned out, definitely will be making another one for sure. I will keep this album on my desk at work. Check out the additional pictures below of the album. Make sure you head over to the Kit and Clowder Facebook group and pick up this image. That's all for now, thanks for stopping by. Hello my friends, thanks for stopping by. It's Monday, yes Monday and the weekend went by so quickly. I just need one more day..... one more day to craft. 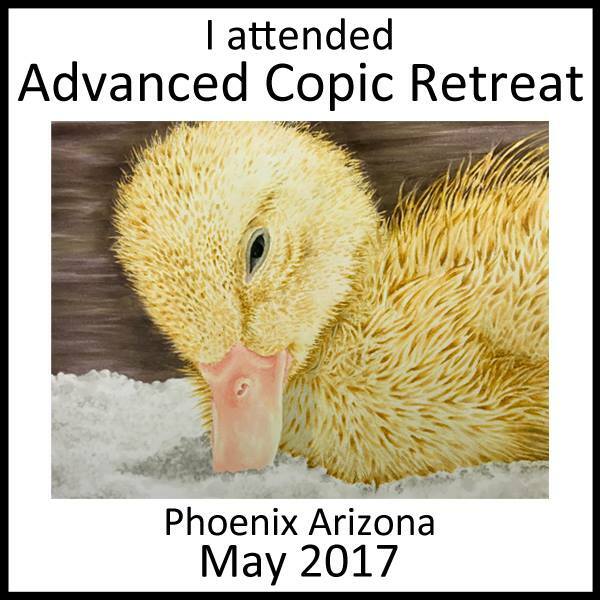 I am definitely looking forward to the end of the year when I can get some time off so I can craft until the wee hours. 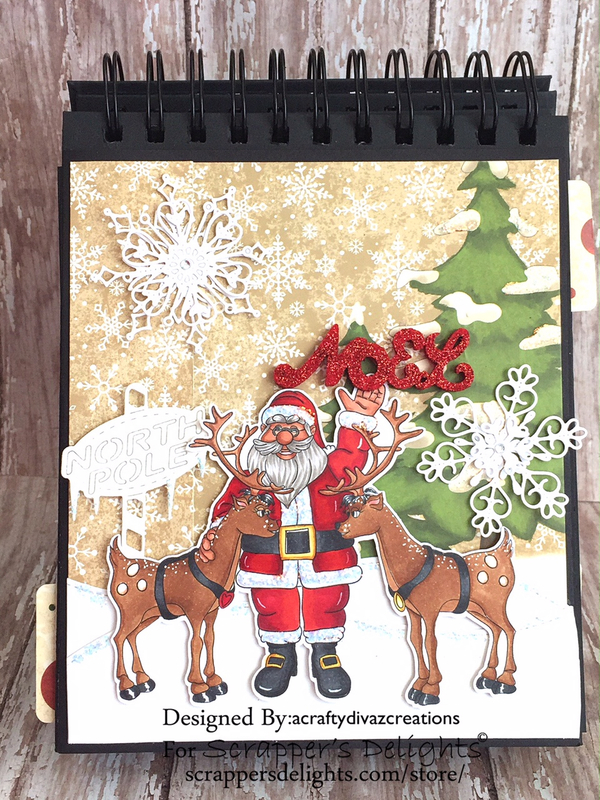 How many of you have completed your Christmas cards? Well if you have, my hats off to you. 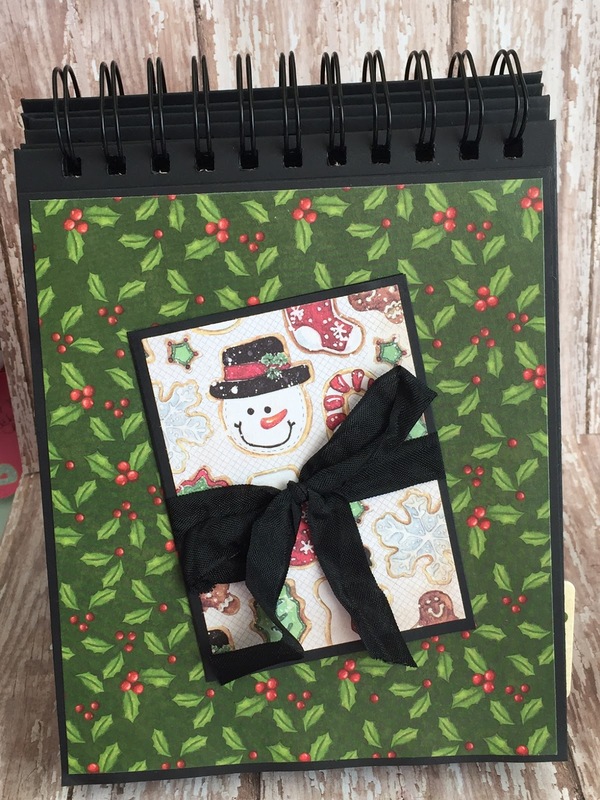 I am still working on Christmas cards, I started late what can I say. Here is a card that I created using the new Poinsettia Tilda. She is such a cutie and I love she is holding a poinsettia behind her back. 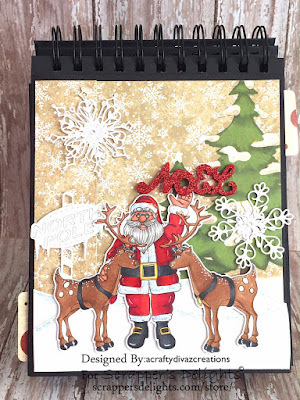 I created a easel card and colored the image with my copics (colors used are below). 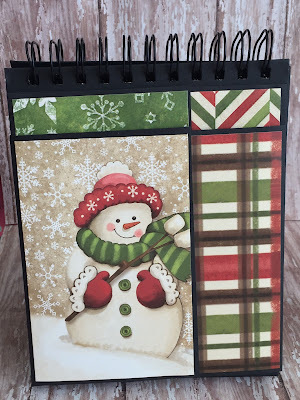 I used designer papers from a new paper pad I purchased at my local craft store. 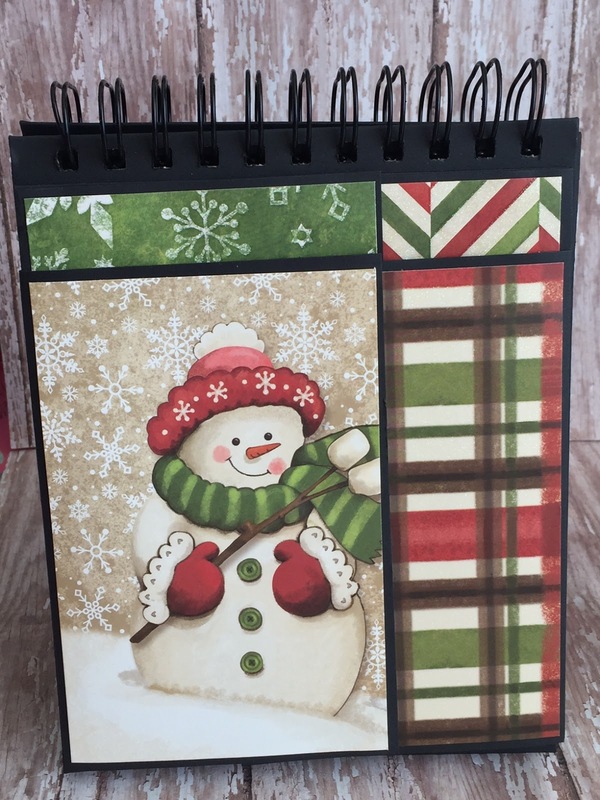 The snowflake borders and the winter trees dies are from the Doohickey club volume 2. 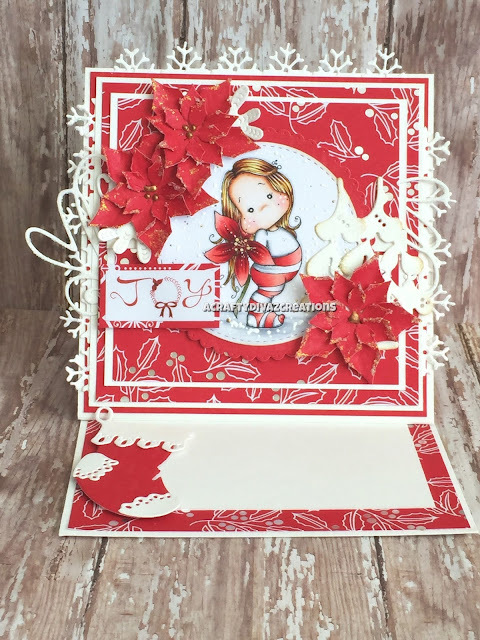 I wanted to add poinsettia around the image and I used the poinsettia die from spellbinders. I added nuevo copper penny crystal drops to create the inside of the poinsettia's and add dimension. The sentiment is from the designer paper stack. 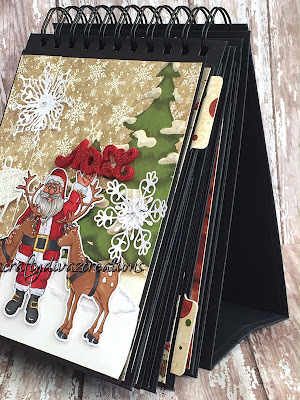 The inside of the card, I added the stocking from the Doohicky Club volume two as a "stopper". All I need to do is add a personal message and this card will go in the mail. That's all for today, hope this provides some Christmas inspiration. Hello my friends, thanks for stopping by. 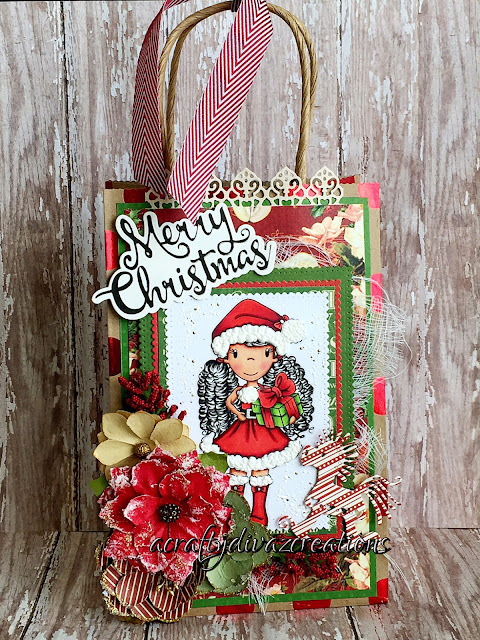 Today I want to share Christmas Tags inspired by Frank Garcia from Prima. I've always wanted to create some of these tags either on my own or in one of Frank's classes. Well, his classes are not in my neck of the woods. 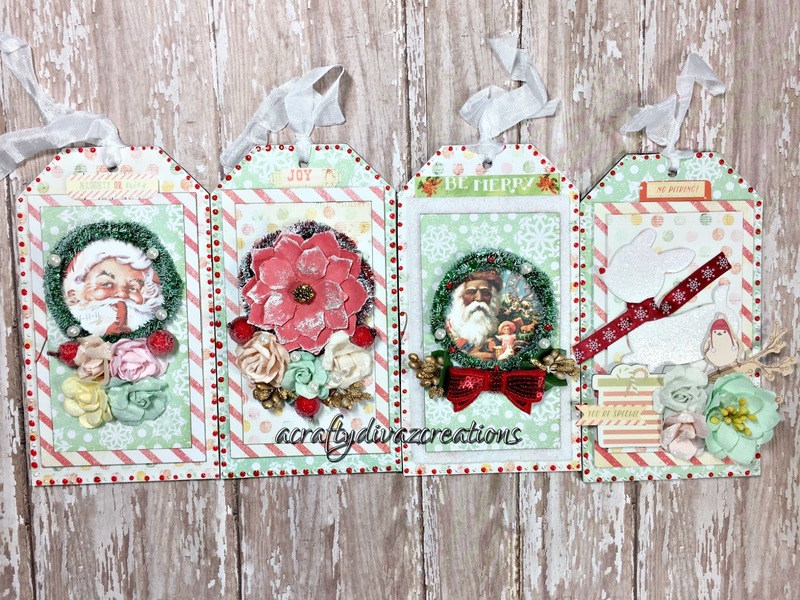 So I decided to pull out my stash and create the christmas tags that are created in his classes using the sweet peppermint collection by Frank. I love this collection, who I am kidding I love all of Frank's collections. Now on to my tags, I created. 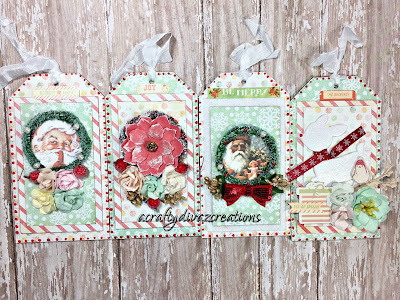 I love the way these tags turned out, I truly used items from my stash. I hope this brings some inspiration to pull out your stash and create. That's all I have for now, thanks for stopping by.